Major routes to the South, Italy and Switzerland are affected. Five French tourist areas have banned driving older vehicles due to poor air quality: Paris, Strasbourg, Lyon, Annecy and Isère (Alpine region, Grenoble). In these zones, cars without the Crit'Air badge and those with Crit'Air Class 5 and in some cases Class 4 are no longer allowed to drive. In the case of Isère, the whole department with its highways (A7 and A41 to 47) is affected. The Green-Zones smartphone app can keep you up to date. In France, temporary air protection zones are imposed where bans on driving older cars, vans, motorhomes and trucks are only imposed within the environmental zones if air pollution is particularly high. It is now. Vehicles with Crit-Air badges marked Green or 1, 2 or 3 may continue to be driven. But vehicles without Crit-Air badges, or with Crit-Air category 5 (and in some cases Crit-Air category 4) cannot be driven without incurring penalties. Tourists as well as professional drivers should be careful, because the penalties are high. If you do not have the required badge, it may be better to leave the vehicle standing or drive around the environmental zones. However, anyone who has a badge marked 3, 2, 1 or E may continue to drive. 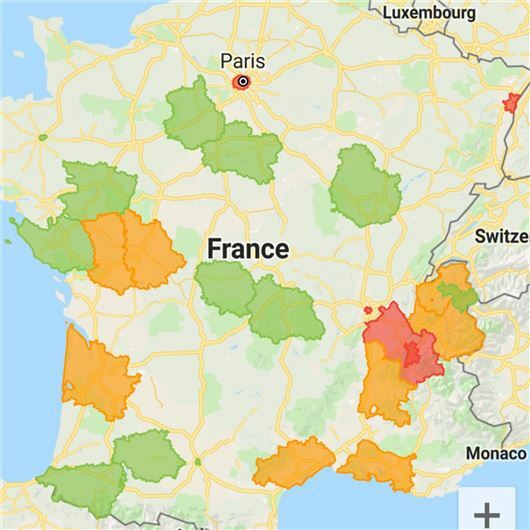 A map of the affected environmental zones and all the necessary information are available in many languages on the website www.crit-air.fr and at Green Zones App. That crit air site you have linked to charges €30 for a crit air sticker! please link only to the French government website where a crit air sticker costs €3 instead. Don't link to scammers! All maps are available on this site. The sticker should cost no more than €5 inclusive of postage to UK. I Paid about €4.25. Does the HonestJohn website get a payback from link clicks to the scamming site perhaps? If so, it's unfair and misleading to consumers. I don't understand MarcusVia's criticism. Is it possible to remove the link to the non-official site to avoid any confusion? It's not a criticism at all, I wouldn't have known about the certification requirements if I hadn't visited your site so I'm very grateful for the advice. The official site which you have linked to has all the information you require as a tourist and even warns: "Please be aware of scams : some sites offer air quality certificates at a higher rate than the one set by the regulations (as a reminder, it costs €3.11 plus postage).". So a link to a non-official site isn't really necessary. Useful information and I've used www.certificat-air.gouv.fr/en/ to buy mine although you have to scan your v5 at low res to make it fit in the file size limits.